From a technical perspective, the tweed Champ is an elegantly simple design. Let's put some hard numbers on it. The #1 input jack connects to a classic gamma network comprised of grid-leak resistor RG and the effective grid-stopper resistance RGS comprised of two 68kΩ resistors in parallel. Across the network there is unity (0dB) midrange gain and very little treble attenuation due to Miller capacitance. The purpose of the 34kΩ grid-stopper resistance is to attenuate only radio frequencies. 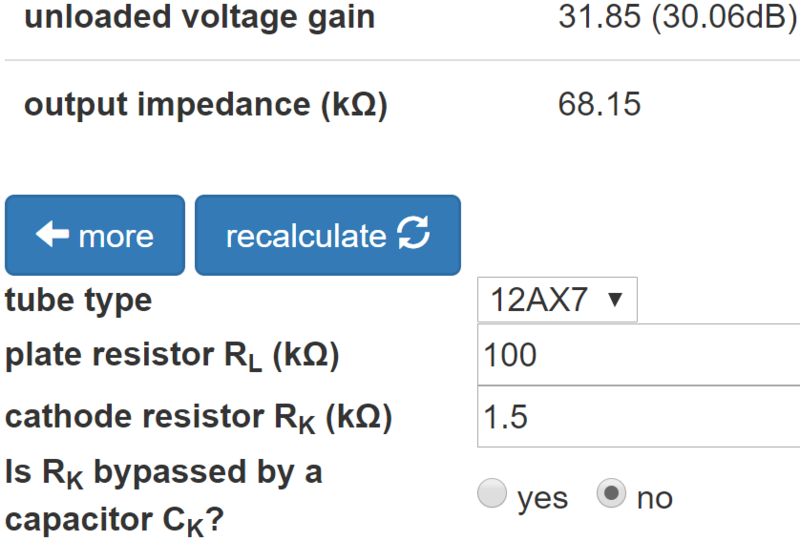 According to the 12AX7 calculator, for a plate supply voltage of 260V, a 100kΩ plate load resistor, and a 1.5kΩ cathode resistor, the DC grid bias is -1.4V. Fender's measured value is close: -1.5V. 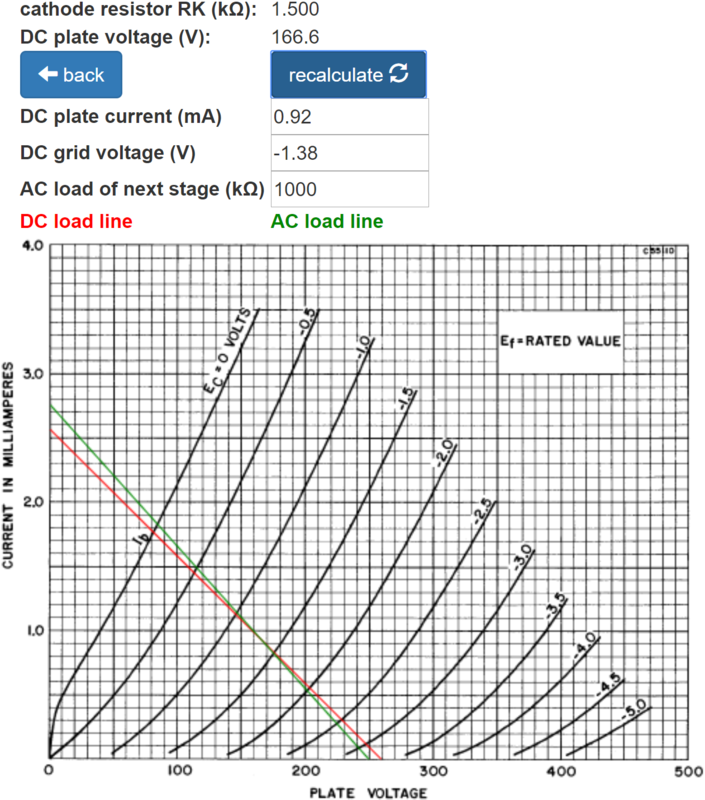 The green AC load line is based on the 1MΩ AC load established by the volume control. It indicates that the grid voltage can swing from 0V to -3V, so the bias is relatively neutral and input headroom is 1.4V peak (-0.1dBV), well beyond the output of a typical pickup. The Cathode Bypass Capacitor calculator shows that the 25μF capacitor fully bypasses the cathode resistor RK1. Gain at 82Hz, low E on a guitar with standard tuning, is attenuated by less than a tenth of a dB compared to midrange. 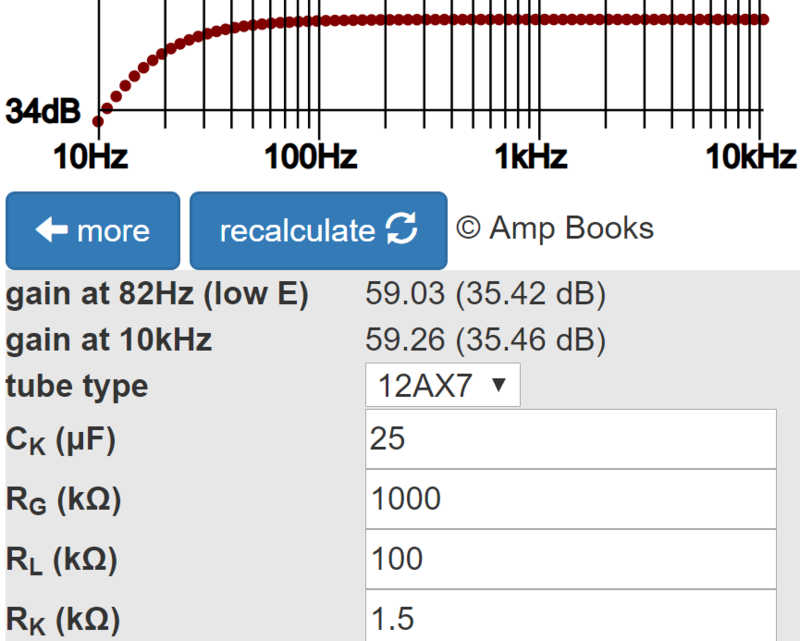 The Preamp Gain and Output Impedance calculator shows that the unloaded gain and output impedance are 35.8dB and 38kΩ, respectively. 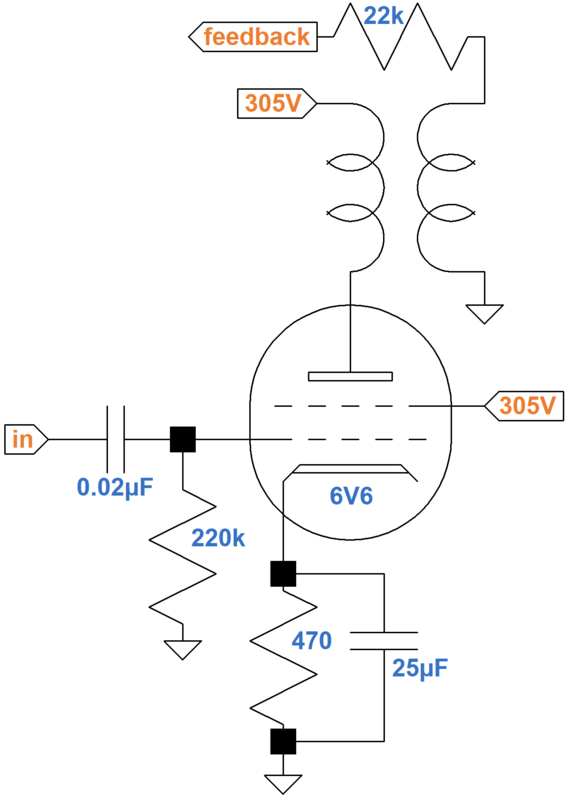 The output impedance and 1MΩ volume control form a voltage divider with a voltage "gain" of 1MΩ/(1MΩ + 38kΩ) = 0.96 (-0.3dB). The loaded gain, measured from the grid of the first triode to the top of the volume control, is therefore 35.5dB. 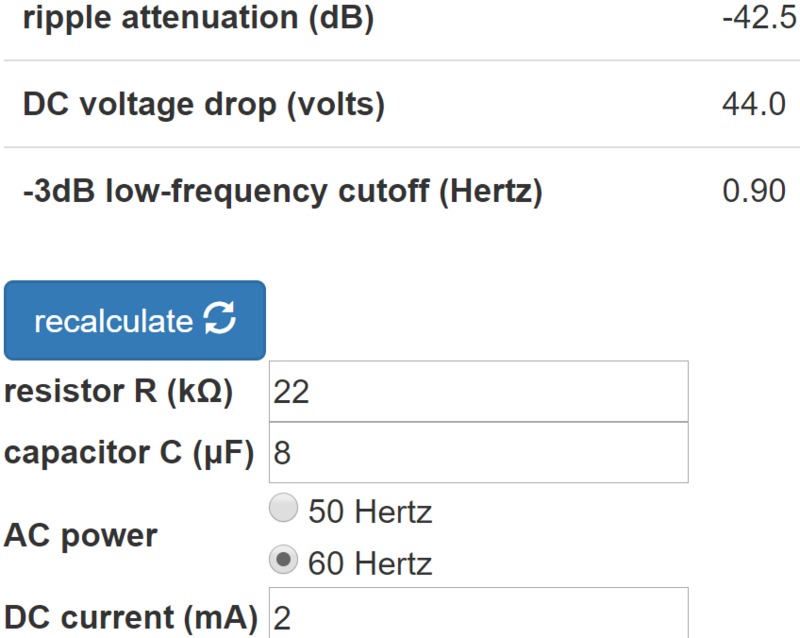 The Coupling Capacitor calculator shows that 0.02μF provides an adequate bass response. Gain at 82Hz is down by less than a tenth of a dB. 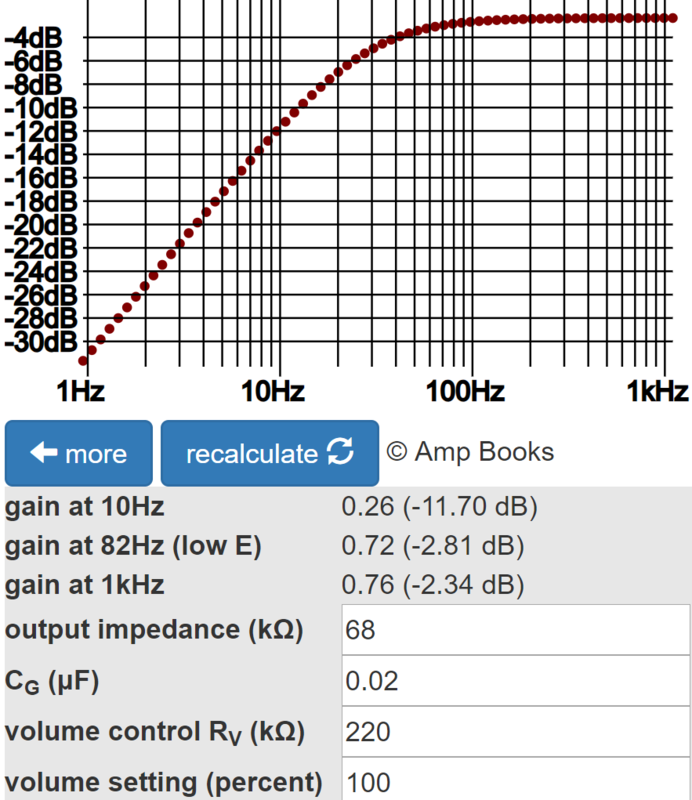 Gain at 10Hz, well below audio, is down by 2dB, which contributes to inter-stage plate supply decoupling. The 1.5kΩ cathode resistor for the second stage is not bypassed by a capacitor, creating negative feedback from cathode degeneration. This reduces gain and increases input headroom. 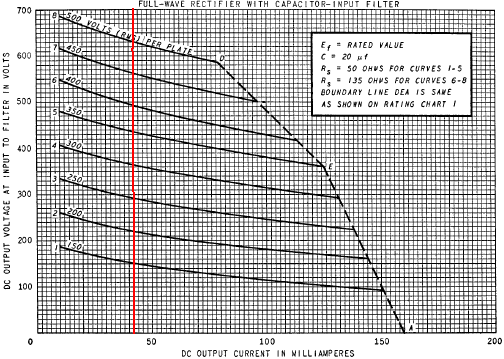 The DC grid bias is -1.4V, just like first stage. Fender measures -1.5V. The second stage drives a 220kΩ load, which is lower than for the first stage, increasing the clockwise rotation of the AC load line around the DC operating point. Idle plate current is 0.92mA. For the grid-to-cathode voltage to swing to 0V, the grid-to-ground voltage needs to swing positive by 1.4V plus an additional (2mA-0.92mA)(1.5kΩ) = 1.6V, i.e. 3V peak (+6.5dBV), representing input headroom. 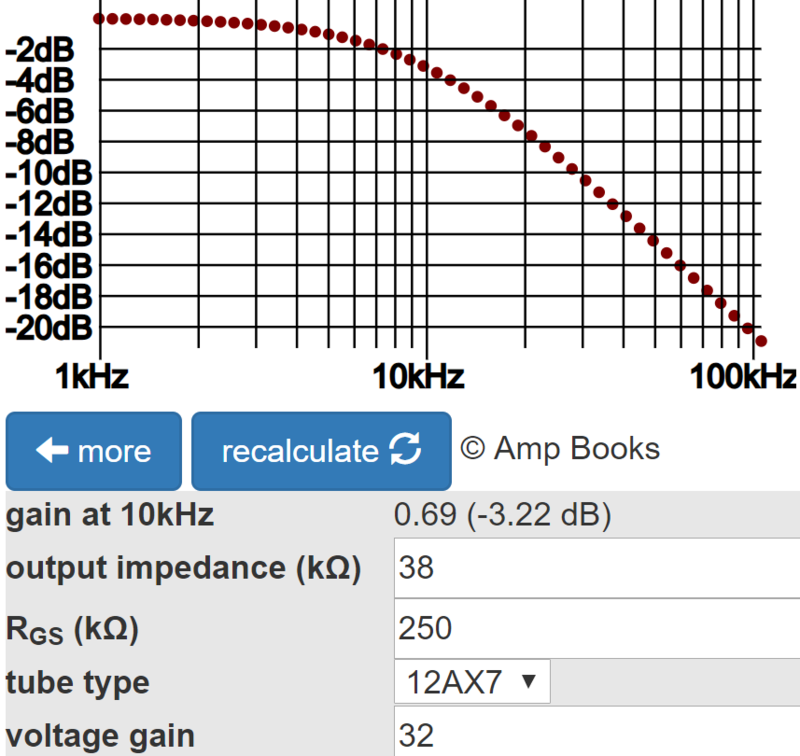 According to the Preamp Gain and Output Impedance calculator, the unloaded gain and output impedance for the second stage are 30dB and 68kΩ, respectively. 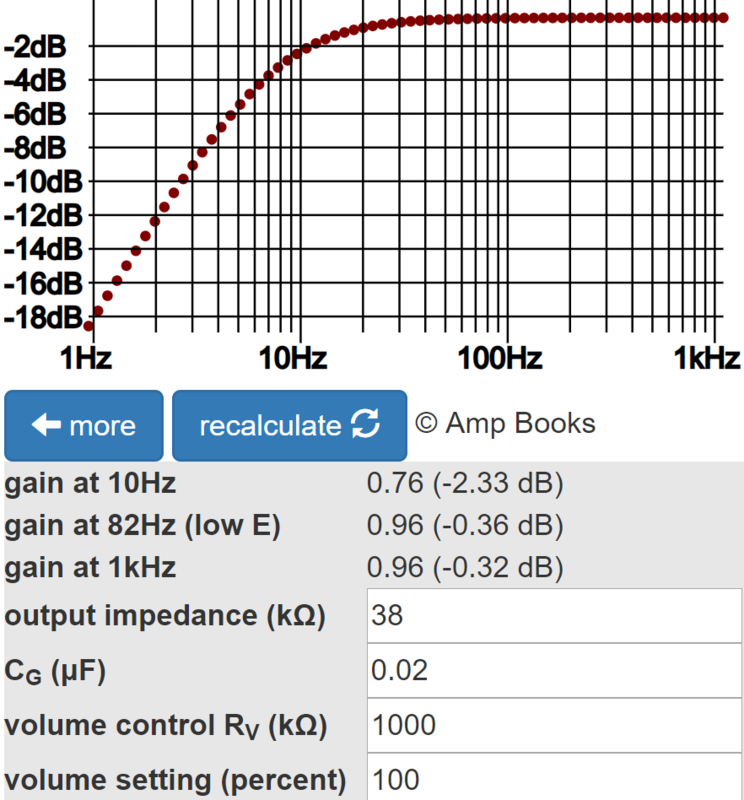 The Coupling Capacitor calculator verifies that 0.02μF provides an adequate bass response. There is increased attenuation because of the increased AC load: 220kΩ compared to 1MΩ for the first stage. The Champ does not have a grid-stopper resistor per se, but the volume control and output impedance of the first stage act as a series resistance for the Miller capacitance between the second triode's grid and cathode, forming a low-pass filter. Treble attenuation is greatest when the volume is set to about 50-percent resistance. 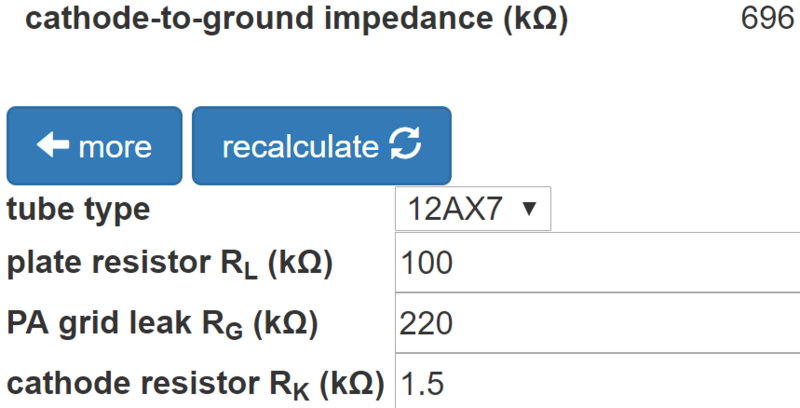 If we assume about 250kΩ grid-stopper resistance in the coupling between the first and second stages, the Grid Stopper Resistor calculator shows about 3dB attenuation at the upper extreme of treble, which is inconsequential. At other volume settings, treble attenuation is even less. only about 68kΩ series resistance. Subtracting the loaded gain of the first stage, the input signal level needed to overdrive the second stage with the volume control set to maximum is +6.5dBV - 35.5dB = -29dBV (50mV peak). This level is within the capabilities of a single-coil pickup, so if the guitar controls and the Champ's volume control are set to maximum, expect second-stage overdrive. Long before then, however, the power amp exceeds its limits of headroom, which is 19V peak, as will be seen. Maximum second-stage plate voltage swing is about 3 times greater, so the power amp is the first stage to reach overdrive. The Champ has a single-ended, cathode biased power amp. Fender's measured voltage across the 470Ω cathode resistor is 19 volts, so by Ohm's Law the current through it is 40mA. This is the current through the cathode, which is the sum of the plate and screen currents. Let's see how this matches published transfer characteristics. 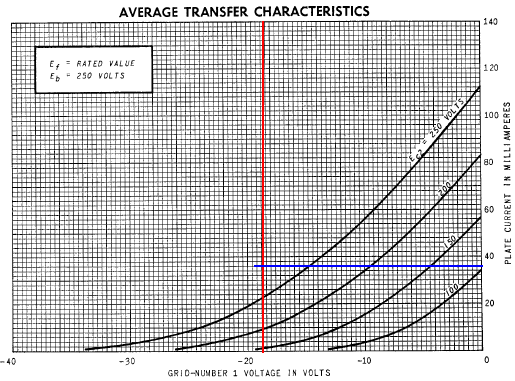 Here is the screen current as a function of grid voltage. 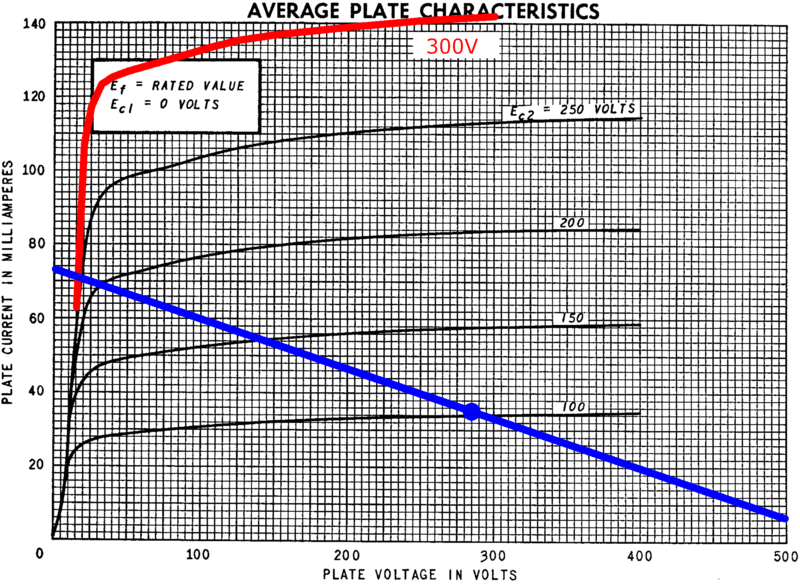 If we imagine a curve on the plate current plot corresponding to a screen voltage of 305V - 19V = 286V, we can envision the lower left end crossing into cutoff somewhere in the vicinity of -38 grid volts, so the grid swings from -38V to 0V, centered on the DC grid bias of -19V. The DC operating point is defined by a grid-to-cathode voltage of -19V, a plate current of 37mA, and a plate-to-cathode voltage of 286V. Here is a load line through the DC operating point for an output transformer with an 8kΩ primary impedance. cathode resistor RK2 in parallel with the cathode impedance of the voltage amplifier. 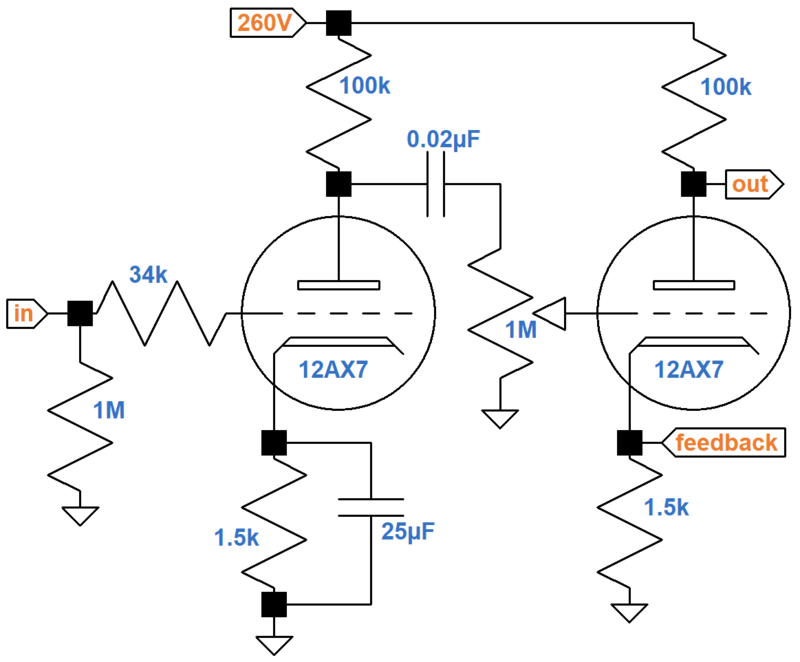 The voltage amplifier's gain, including the load of the power amp's 220kΩ grid-leak resistor, is 24. The Champ produces about 5W RMS into a 3.2Ω speaker, for an RMS voltage of 4V. The power tube grid is cathode biased at -19V, so at full power the RMS power amp input voltage is 13.4V. Voltage gain is the ratio of output voltage to input voltage: 4V/13.4V = 0.3. This makes the forward gain equal to G = (24)(0.3) = 7.2. According to the Cathode Impedance calculator, the effective impedance between the 12AX7 voltage amplifier's cathode and ground is 696Ω. A voltage divider is formed by the 22kΩ feedback resistor RF and the 696Ω effective shunt resistance. The feedback gain from the output transformer secondary to the cathode of the preamp tube is therefore 696Ω/(696Ω+22kΩ) = 0.031. This means the voltage gain for the two stages decreases from a value of G = 7.2 without feedback to a value of G/(1-HG) = 7.2/[1+(0.031)(7.2)] = 5.9 with negative feedback. This represents only 2dB attenuation. Guitar amplifiers generally use only modest amounts of negative feedback. The Champ's input sensitivity is the signal amplitude at the amplifier's input jack needed to drive the power amp to full power. There are only two stages of voltage gain but no tone stack and only moderate negative feedback. It takes 19V peak (+22.6dBV) to drive the power amp to full power. Accounting for 2dB attenuation from negative feedback, a second stage loaded gain of 24 (27.6dB), 20dB attenuation from a volume control at 50-percent rotation (10-percent resistance), and a first stage loaded gain of 35.5dB, input sensitivity at the guitar input jack is 22.6dBV + 2dB - 27.6dB + 20dB - 35.5dB = -18.5dBV (168mV peak). With the volume control at maximum, sensitivity is -38.5dBV (17mV peak). Even by modern standards this represents respectable gain. The Champ 5E1 power supply uses a 250-0-250 volt RMS power transformer and a 5Y3GT vacuum tube rectifier. They drive a capacitor input filter, an LC filter, and an RC filter. The power supply needs to provide the plate and screen currents for two triodes and one power tube. At idle, the 12AX7 triodes each draw 0.9mA. The 6V6 screen draws 3mA and the plate draws 37mA, so the total load current is 42mA. Without a load the DC output of the power supply would be 354V, the peak output voltage for a 250V RMS power transformer secondary. 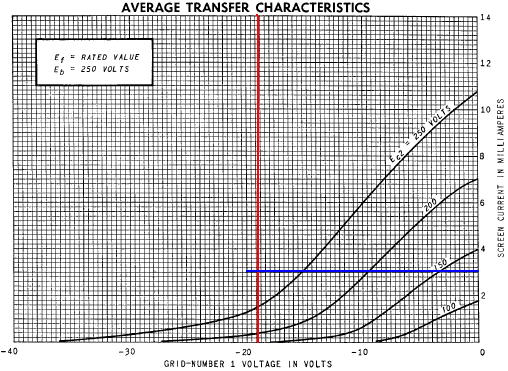 According to the 5Y3GT data sheet, a 42mA load causes the voltage to sag to 290V, as shown here where the red line crosses the 250V RMS curve. 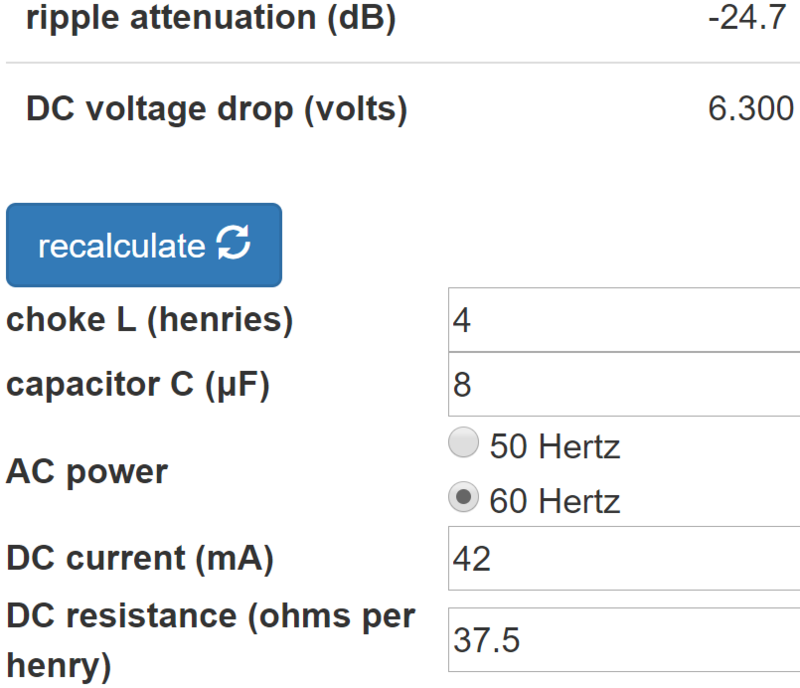 According to the LC Ripple Filter Calculator (assuming the choke has a DC resistance of 37.5Ω per henry, which is typical for a Champ replacement choke), the filter provides 24.7dB ripple attenuation. The DC voltage drop is 6V, so the plate and screen supply is 290V - 6V = 284V. This is within 7-percent of Fender's published value of 305V. According to the RC Ripple Filter Calculator, the filter provides 42.5dB ripple attenuation. Our thanks to Richard Grisel of Institut National des Sciences Appliquées de Rouen for his technical assistance with this page. 1Dave Hunter, Amped, (Minneapolis: Voyageur Press, 2012), p. 40.